Cochin Shipyard Limited (CSL) Issued a Advertisement For Recruiting 198 Fabrication and Outfit Assistant, Semi Skilled.All Eligible And Willing Candidates Can Check Detailed Advertisement From Their Official Website And Apply Online / Before 30-07-2017.Eligible &Interested Candidates Can Check Detailed Information For Each Postion Such As - Eligibility Criteria, Qualifications, Age Limit, Selection Procedure Before Applying. 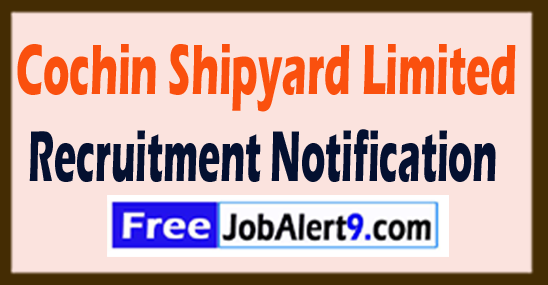 Cochin Shipyard Limited (CSL) Recruitment 2017. Age Limit : Candidates Maximum Age Should Not Exceed 30 Years As On 30-07-2017For Postwise Age . Educational Qualification : Candidates Must Pass 4th, 10th, 12th, ITI Or Its Equivalent Qualification From A Recognized Board / University. 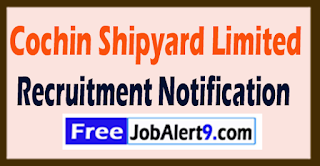 The Chief General Manager (HR), Cochin Shipyard Ltd, Perumanoor P.O, Kochi- 682015. Important Dates : Last Date for Registration of Online Application Form Is: 30-07-2017 . Click Here For CSL Recruitment 2017 Detailed Advertisement. Cochin Shipyard Limited (CSL) Issued a Advertisement For Recruiting 04 Accountant .All Eligible And Willing Candidates Can Check Detailed Advertisement From Their Official Website And Apply Online / Before 09-09-2017.Eligible &Interested Candidates Can Check Detailed Information For Each Postion Such As - Eligibility Criteria, Qualifications, Age Limit, Selection Procedure Before Applying. Age Limit : Candidates Maximum Age Should Not Exceed 40 Years. Salary And Grade Pay Scale: INR Rs.11200 - 29500/-. .
Educational Qualification : Candidates Must Pass Graduation Degree Or Its Equivalent Qualification From A Recognized Board / University. Candidates may fill the online Application through official website (http://www.cochinshipyard.com). After Successfully Submitting the Application, Candidate must send hard by copies of Application along with relevant testimonials to the Following Address Before (09-08-2017).